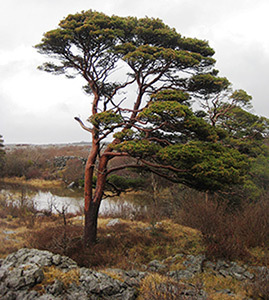 Members may wish to visit the site of the Scots pine discovered by Prof. Fraser Mitchell and his students (Dr Jenni Roche and Alwynne McGeever) in Co. Clare. 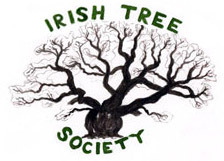 The link provided in the brief news item (to Journal of Biogeography – a full account of the discovery) identifies the location explicitly as Rockforest, Co. Clare: so it is not secret. Rockforest is located immediately W of the Gort to Corofin road, S of Lough Bunny, and the Scots pine stand is SW of Rockforest Lough. The mature pine trees grow on open limestone pavement, I am informed by Prof. Mitchell: “you have to fight though some blackthorn scrub to get to it – so wear a thick coat!”. It is possibly misleading if you see pine trees on deeper soil adjacent to Rockforest House, where they are intermingled with larch and fir – planted, of course: this is not the site investigated. The mature, presumptively native, pine trees are SW of this plantation, growing in grikes on the pavement, evidently not planted and in a “rather impenetrable area due to blackthorn scrub” and without any other conifer species. Unpublished preliminary genetic analysis by Dr Colin Kelleher (National Botanic Gardens) indicates that these pine trees “differ from elsewhere”. I am grateful to Prof. Mitchell for this enlightenment. 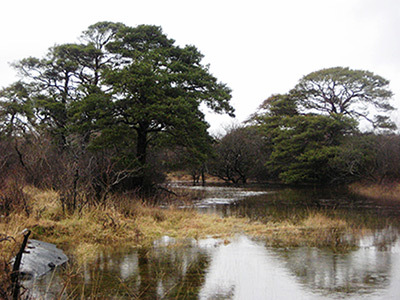 Two images of the Scots pine stand, courtesy of Dr Colin Kelleher, are attached. They are evidently taken in winter: blackthorn shrubs leafless and pavement somewhat flooded.